Shrimp are easy, versatile and quick to cook, which is why we frequently include them on our entertaining menus. 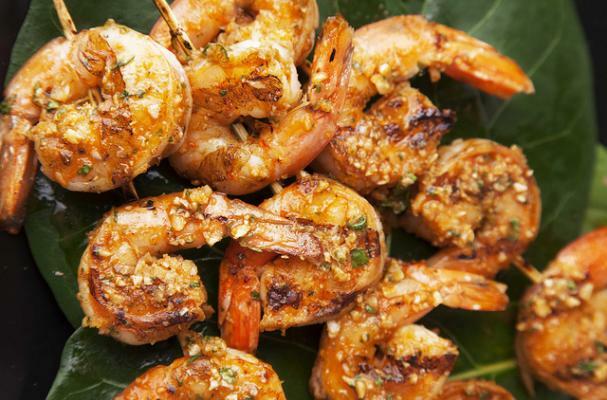 These spicy, garlic-loaded grilled shrimp are the perfect appetizer for your Game Day party. Simply grill them up and serve them on the skewers for easy eating. Pour the oil into a heavy, ovenproof medium saucepan and add the garlic. Cover the pot with foil, transfer to the oven, and cook until the garlic turns a nutty brown and is very soft (think cream cheese), about 45 minutes. Remove the pot from the oven and let the garlic and oil cool to room temperature. Transfer the garlic and the now garlic-infused oil into a food processor or blender. Add the Tabasco Chipotle Sauce, cilantro, lime zest, and salt and puree until the mixture is very smooth. Brush a generous amount of the sauce onto each side of the shrimp, then lightly season with salt and pepper. Cook on the grill for approximately 1 to 2 minutes on each side. Combine all ingredients in a glass bowl and mix until well incorporated. For additional spice, lightly brush each side of the shrimp with the Habanero Butter while grilling, or serve with shrimp for dipping.